Like anything in life, you’re always learning on the job as a real estate agent. Your education in this field will continue long after you’ve passed your exams in real estate school. You’ll spend time learning alongside your associates as your progress in your career in real estate and benefit from the agents you network with whom have experience in the field. However, if you’re looking to expand your knowledge in real estate and pick up some handy certificates along the way there are many routes to pursue. 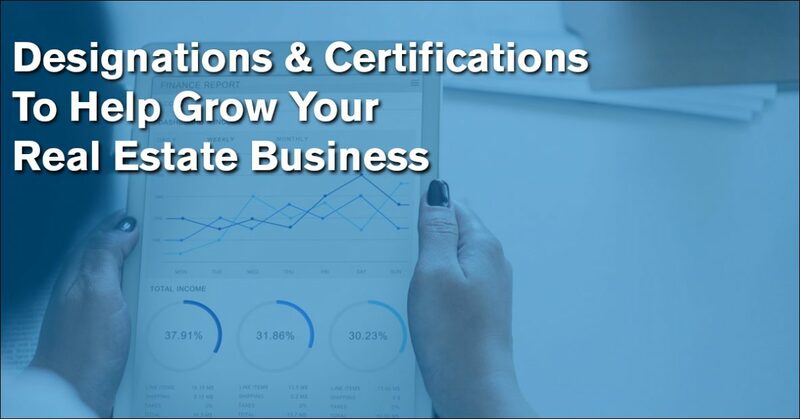 The National Association of REALTORS® and it’s affiliates provide a wide-range of designations and certifications that can help increase your knowledge and skills in the business! Below is a list of the most popular designations recognized by NAR. A CCIM is a recognized expert in the commercial and investment real estate industry. The designation process ensures that CCIMs are proficient not only in theory, but also in practice. This elite corps of CCIMs includes brokers, leasing professionals, investment counselors, asset managers, appraisers, corporate real estate executives, property managers, developers, institutional investors, commercial lenders, attorneys, bankers, and other allied professionals. The Accredited Buyer’s Representative (ABR®) designation is for real estate buyer agents who focus on working directly with buyer-clients at every stage of the home-buying process. The Certified Real Estate Brokerage Manager (CRB) designation is designed for experienced owners, brokers, managers, and supervisors to raise professional standards, strengthen individual and office performance, and sharpen expertise in brokerage management. Since 1968, CRB has represented the highest level of professional achievement in real estate brokerage management. You do not need a broker’s license to earn the CRB designation. Certified Property Managers® (CPM®) are recognized as experts in real estate management, and they are at the top of the profession. 70% of those who hold the CPM® designation hold the highest management positions in their offices (owner/partner/officer/director). These designations are some of the more popular ones available to agents looks to expand their business. NAR and it’s affiliates do offer other certifications and designations that you can use to expand your real estate horizons. You can view these designations here. To learn how Zen Commissions can help your real estate business’ cash flow click here!